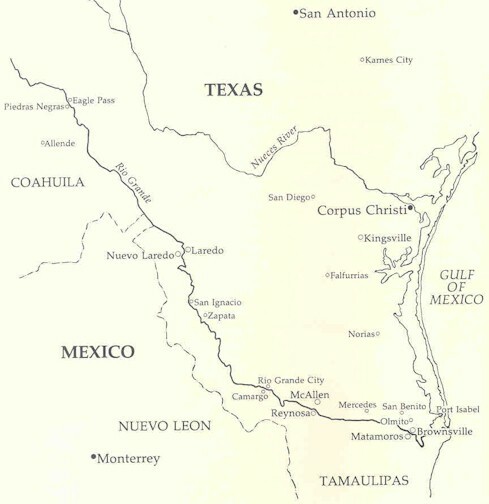 Corrido: a narrative song, or ballad, whose characters, events and themes are representative of the values and history of local communities in the United States and Mexico. This site features a brief history of the Mexican Corrido and the Corridos of Gregorio Cortez, Ramón Delgado and Jacinto Treviño. The main focus of this site is that of intercultural conflict between the Texas Rangers and the Mexican - American community. Listed below are common myths about the Mexican and the characteristics of a Texas Ranger. The Anglo- Texan has a set of attitudes and beliefs about the Mexican which form a legend of their own. This legend of the Mexican is not found in the cowboy ballads or in the folktales of the people of Texas. It is found in magazines, newspapers and books that have been circulated the most. 1. The Mexican is cruel by nature and the Texan must, in self defense, treat the Mexican cruelly, since that is the only treatment the Mexican understands. Walter Prescott Webb says the that the Mexican is "the most merciless and implacable foes know to mankind." 2. The Mexican is cowardly and treacherous, and no match for the Texan. He can get the better of the Texan only by stabbing him in the back or by ganging up on him with the crowd of accomplices. 3. Thievery is second nature in the Mexican, especially horse and cattle rustling, and on the whole he is about as degenerate a specimen of humanity as may be found anywhere. 4. The degeneracy of the Mexican is due to his mixed blood though the elements in the mixture were inferior to begin with. He is descended from the Spaniard, a second rate type of European, and from the equally substandard Indian of Mexico, who must not be confused with the noble savages on North America. 5. The Mexican has always recognized the Texan as his superior and thinks of him as belonging to a race separate from other Americans. 6. The Texan has no equal anywhere, but within Texas itself there developed a special breed of men, the Texas Rangers, in whom the Texan's qualities reached their culmination. The Texas Rangers are pictured as fearless men who are capable of incredible feats. The Ranger is given credit for ending lawlessness and disorder along the Rio Grande. The rangers were known as rinches to the border people and is very important in folklore of the border. Rinche is not only used to label the Texas Ranger but rather to label any other Americans who are armed and and mounted and looking for Mexicans to kill. What the Border Mexican thought of the Ranger is best described in sayings and anecdotes. For example, the Texas Ranger carries a rusty old gun in his saddlebags. This is used when he kills an unarmed Mexican. After shooting the Mexican, he drops the gun next to the body and claims he killed the Mexican after a furious battle and in self defense. When the ranger has to kill an armed Mexican, the Ranger has to catch him asleep or he shoots him in the back. The Ranger always runs and hides behind the American soldiers when real trouble starts. If it weren't for the soldiers, the ranger would not dare come to the border.